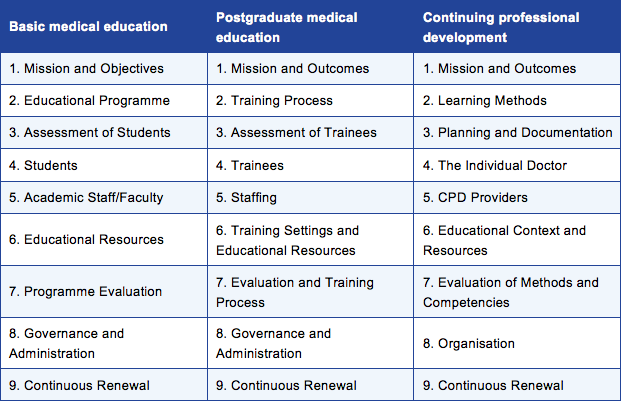 The WFME standards are a global expert consensus on the standards for medical schools and other providers of medical education throughout the continuum of medical education and training: Basic Medical Education, Post Graduate Medical Education, and Continuing Professional Development. The standards are divided into basic standards (minimum requirements) and quality improvement standards, accompanied by annotations and definitions. Standards are intended to guide the development and evaluation of medical education programmes. Standards provide a framework to be customised for the local context. Standards do not offer a universal core curriculum. Not all of the WFME standards will be relevant in every setting. In 2011, WFME estimated that the global standards had been used by around half of medical schools worldwide. The standards are endorsed by the World Health Organization (see 2013 policy briefing on accreditation), the World Medical Association (2004 resolution) and IAMRA (see 2016 statement on accreditation). Intended audience: health authorities, medical associations, medical schools and national and international institutions and organisations dealing with basic medical education in all countries. It is possible for a medical school to receive a satisfactory overall evaluation and maintain accreditation (where appropriate) without necessarily meeting every standard and sub-standard. to safeguard practice in medicine and the medical workforce in the context of increasing internationalisation. The original trilogy of WFME global standards (2003) was developed by three international taskforces involving more than 60 medical education experts from across the six WHO-WFME regions. Updates were defined by a small working group and a broad international panel of experts (2012, 2015). It is the prerogative of nationally appointed agencies to determine the level that will be required for accreditation of medical schools within the remit of each agency. The WFME standards offer a template for accreditation but the level must be specified, modified or supplemented in accordance with regional, national and institutional needs and priorities. Standards must be clearly defined, and be meaningful, appropriate, relevant, measurable, achievable and accepted by the users. Furthermore, accreditation must give emphasis to improvement, and provide guidance for advancement, instead of simply advocating ‘fulfilment of standards’ as the ultimate goal. Supplementary guidance published alongside the 2015 Standards in BME describes how an accrediting agency might interpret the standards to define measures for how a medical school meets the different aspects. WFME publishes the standards in English. We do not have the resource to provide official translations of the standards documents, however we are keen to make the standards accessible. We publish translations on the WFME website, with credit given to the translator, where we are confident that the nuances of the language and the intended meaning has been conveyed. WFME can offer advice to a medical school or agency in interpreting the WFME standards in the local, regional or national context. Details of how to request an advisory visit and associated fees are set out in the WFME policy.